Since the dawn of time, slimes have always been man’s best friend. Well no, that’s not true, but they have always been some of the most common enemies in many video games like Dragon Quest, with some variations like the Flans in Final Fantasy or Poring in Ragnarok Online. Usually slimes are cute, with gelatinous bodies, and are apparently good fighters, as Super Slime Arena has 32 unique slimes to fight one against the other for supremacy! Well, at least I imagine that’s the reason for the fighting. Super Slime Arena is a very simple game with no story, no arcade mode, no single player whatsoever, and is completely focused on multiplayer. Thankfully this includes both local multiplayer and online multiplayer, but first let me explain the gameplay of this arena brawler. This is a 2D fighting game in which you have to fight against one or more enemies in a small scenario which may have different platforms similar to Super Smash Bros. Combat consists of two buttons, one for attack and one for jump. The directional pad moves your character and that’s about it. There are no combinations or complex combos, and all attacks kill with one hit. However, don’t think that this is simply a game to see who can mash buttons faster. The attack of each slime is different: some may attack in front of them, or with some delay, others deal area damage or attack from range. Also, once an attack is made there is a small cool-down, so combat consists of mainly reading your opponent, waiting for them to make their attack, and responding with a counterattack. Similar to Divekick, this is more about the mind games than the actual combat itself. 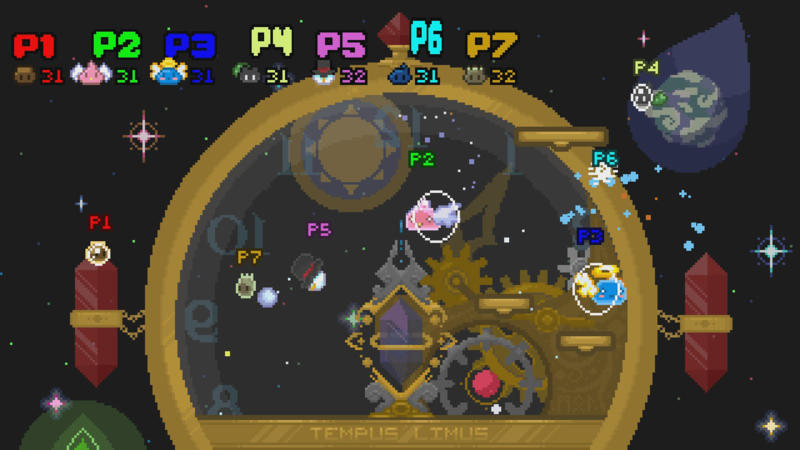 As mentioned above there’s only multiplayer, which consists of four modes. 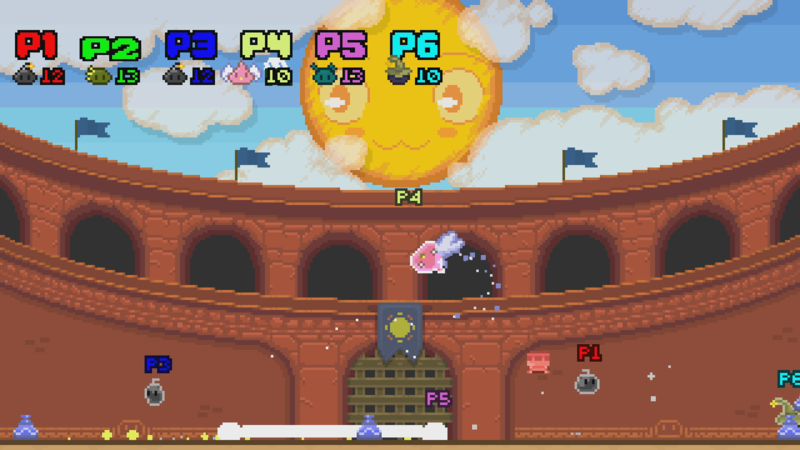 The first one is Elimination, in which each player selects six slimes and fights against each other to be the last one standing. There’s also Shuffle, in which each player has 32 lives, and when you die a different slime is selected at random until you use all of them. Again, last man standing wins. 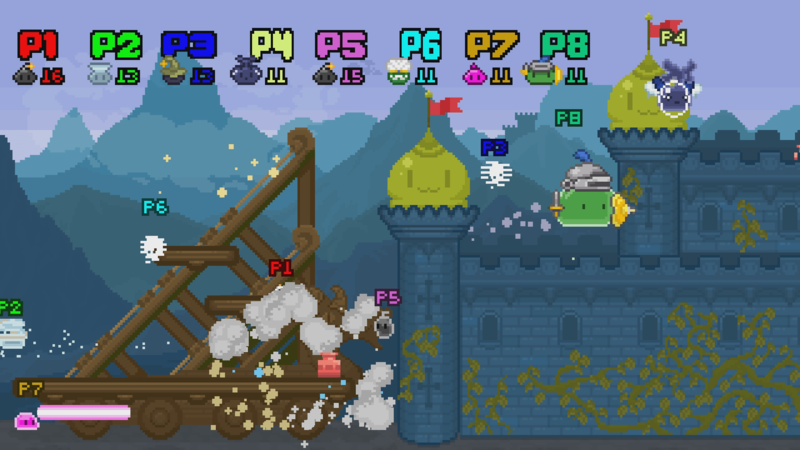 In Monobattle each player will use the same slime and when one dies it changes the slime for everyone to a new one. 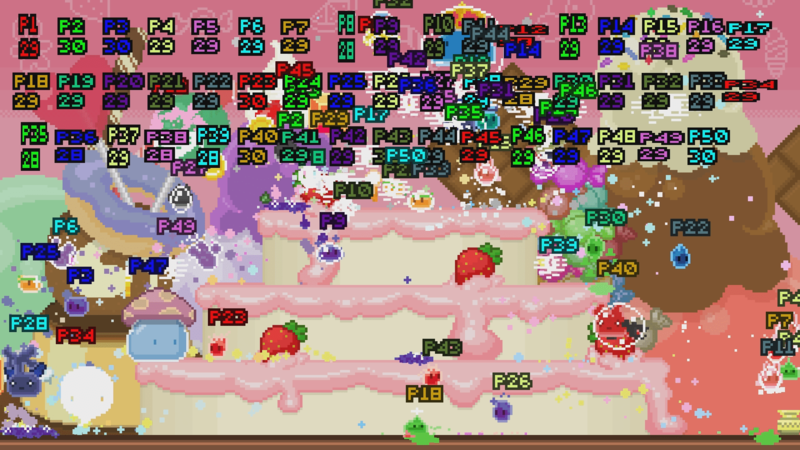 In Swap Mode, you pick three starting slimes and can jump between them with a press of a button. And finally, Slime Rush, which is similar to Shuffle, but when you defeat an enemy your slime will change, and you have to defeat an enemy with each slime once. Something worth mentioning is that this game supports up to 50 players both online and offline. Personally I have never seen a game that allows such a huge number of players at the same time locally (and I doubt a PC has that many USB ports by default) but it’s definitely something to consider. If your whole family is coming this may be the game for you. In regards to online I was able to test it without problems, even though it’s supposed to be in beta at the moment. I only ran into a bit of lag, but it was just for a few seconds. The community is not big unfortunately, and there are barely any available rooms to join, so if you plan to play with strangers it may be a bit difficult. The art department is clearly inspired by the SNES era of videogames. The pixel art used to represent the slimes and backgrounds is of great quality and it overflows with style and details. The music score as well is made of simple synthesizer sounds like in the old days, which wraps up the retro package quite nicely. In conclusion, I really liked Super Slime Arena, but since there’s only multiplayer and few modes I didn’t play it more than two hours. If you have a group of friends that regularly comes over to play video games, this may be a good alternative to play a couple of rounds and have fun. But in general I feel that the game will shine with huge matches of 16 players, which I couldn’t test due to the lack of AI opponents. The game is out for $15 which may feel a bit too much considering there is not a lot of content, but it ultimately will live or die based on your playing group.